Thank you for your interest in Clarke’s Restaurant! Sally Clarke’s Restaurant in Notting Hill Gate, Kensington has been leading the way in serving seasonally-inspired, daily-changing menus for over 30 years. Fresh fish is delivered daily from Cornwall and Scotland, organic lamb and beef from Wales, and corn fed chickens and veal from France. Salads, vegetables, fruits and herbs arrive from the markets of the UK, France, Italy and Spain. Three years ago the Restaurant was beautifully renovated, creating 2 new dining rooms, a Bar Room and a Private Dining Room. 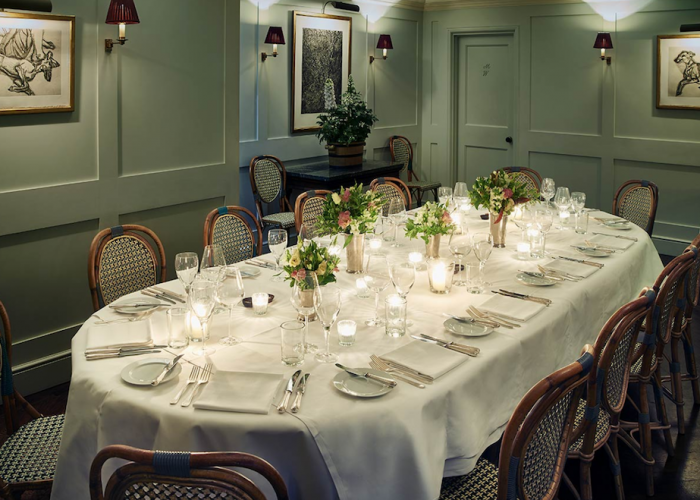 This room which is perfect for a celebration dinner, a lunch gathering, breakfast meeting or cocktail party may comfortably accommodate from 10 – 28 seated, or up to 40 for a standing reception. Each event is organised on a bespoke basis by our Dining Room Manager who liaises directly with the client over menu, wines, floral arrangements and any special requests they may have. Our Restaurant Manager, Sommelier and Executive Head Chef are on hand also with their guidance, to make the planning of an event seamless and painless for the host or hostess.